This week’s forecast will be shortened. I am moving into a new home and I am already feeling the Virgo influences of the next lunar cycle: to get my life in order as I prepare for the fall season ahead. The lunar cycles recently have been located near the end of a sign, so I’ve been tracking the influences of the cusps between signs in my lunar mindfulness work. The current cycle* began in Cancer and transitioned to strong Leo influence, which you may have felt as the blending of deep interior places with external bouts of brilliance. The next lunar cycle we explore the cusp between Leo and Virgo. The metaphor of the king and the apprentice comes to mind for this edge. Leo strives for nobility. Virgo strives to be of service. The step from Leo self-centeredness to Virgo usefulness is an important test of our characters. How do we hold this continuum? Each of us is a Sun (ruler of Leo), needing recognition and a worthy place to shine. But the Virgo role of servant, apprentice, priestess, and healer is a choice, not a certainty. The choice seems to be about taming our egos and finding our place of usefulness and wholeness in the collective. But first, we finish the current Cancer/Leo cycle. During the waning days of this lunar cycle, recall experiences about home and generosity. Both of these qualities carry a shadow and both are essential. What have you discovered about yourself? In the week ahead, Jupiter moves into Virgo for the next year. We find the topics of service, apprenticeship, healing, and order central to the quest for meaning in our lives. In public affairs, we start to value people who are more grounded and pragmatic. The presidential race will begin culling those Leo types (like Donald Trump with a Leo Ascendant), in favor of the Virgo types. (e.g., Bernie Sanders has a Virgo Sun). However, Leo influence isn’t completely over. The New Moon occurs in Leo; Venus is retrograding through Leo and will conjoin Mars in Leo at the end of August. Begin to notice the edge between Leo and Virgo. What helps you keep a healthy relationship to your ego while at the same time keeping a focus on being helpful to others? August 10—Balsamic Moon: Surrendering. The Moon returns to Cancer (cardinal water) where it was at the beginning of this lunar cycle. Do you feel a resonance with the hopes and dreams you had at that time? (July 15). We’ve carried those dreams into the heat of summer. The Sun has ripened the fruit. What are you harvesting now? We give thanks for the dreams that thrived and we grieve the dreams that did not flourish. To step into every lunar cycle is to step into the uncertainties of life. Are you noticing that today? The task is to let go of expectations now. They come again with the next New Moon phase in a few days. Watery Moons (like today’s) remind us to feel what we feel. The trine between the Moon and Neptune encourages taking those feelings into states of compassion and union. Tuesday, August 11. The Moon in Cancer (cardinal water) is a homebody. With Jupiter’s ingress into Virgo (mutable earth) today, don’t be surprised if all you want to think about is home improvements. Jupiter in Virgo expands all the Virgo themes. The quest is for meaning. Mutable signs are about synthesis and integration. During the last few days of this lunar cycle we turn towards the overview. What did you experience? Learn? Hope for? Receive? Jupiter in Virgo will turn our attention to holistic healing arts as well. Diet and lifestyles will be changing. A good place to focus is on your expectations for perfection. The news today might be troubling as the Moon opposes Pluto and squares Uranus, recalling tumultuous calls for change echoed throughout the last few years. Wednesday, August 12. The day starts focused on home and family and slowly changes to needing to let off steam or have fun. The opposition between Mercury in Virgo (mutable earth) and Neptune (mutable water) can inspire visions but makes productive work challenging. You may accomplish more if you let go of expectations and give yourself over to daydreaming. By the evening, when the Moon in Leo (fixed fire) conjoins Mars, we really don’t want to be responsible for much of anything. Express yourself. Thursday, August 13. You might be thinking you are the only one who isn’t as happy as everyone else seems to be. You aren’t. Leo (fixed fire) emphasis includes Mars, Moon, Sun, and Venus (retrograde). All that fun, fiery energy may not be doing it for us. Saturn in Scorpio (fixed water) is still casting a pall over the summer Sun, and that is perfectly OK. We are meant to reflect on our authentic natures right now. And we may be taking things personally. Venus retrograde gives us a reason to question our value to others. The quincunx between the Sun and Chiron in Pisces (mutable water) puts an edge on things. We are a little more sensitive and touchy. A tonic for Leo insecurity is to risk vulnerability and let someone else know how you are feeling. 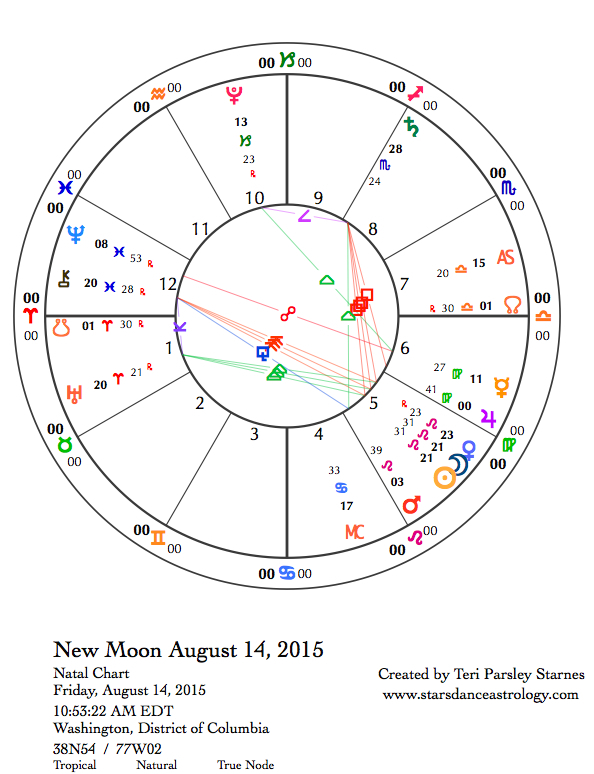 August 14—New Moon: Dreaming. The lunar cycle begins near the end of Leo (fixed fire) and transitions to Virgo (mutable earth) emphasis by August 23. The opportunity for intentional work around the edge between these signs will help us prepare for the fall season ahead. In simple terms, we are learning to value, yet moderate, our egos so we may do meaningful and useful work. The drift is toward integration and pragmatism. If we can negotiate this step from self-absorption to selfless service without flipping into black/white good/bad thinking, we take along with us the Sun’s gift of vital energy. It isn’t about us, and it is about us—a rich paradox. Retrograding Venus in Leo is next to the Sun and Moon in the chart for the New Moon. Tomorrow, Venus and the Sun will exactly conjoin in the heart of this retrograde journey. In the story of Inanna’s journey into the underworld, this moment equates with the meeting of the sisters—when Inanna is reduced to a bag of bones by Ereshkigal (the underworld goddess of death and rebirth). The ancient poem about this journey questions why the Queen of Heaven (Venus/Inanna) would dare to take such a journey. No clear explanation is given and this becomes a core mystery to every Venus retrograde period. Why surrender the significators of external success to risk losing everything in the underworld? Perhaps you are on such a journey of loss and discovery of your self-esteem. Perhaps things that in the past were meaningful to you have changed and you are ready to let that go to find another, deeper truth about yourself. Jupiter in Virgo adds its message of usefulness to the exploration of this cycle. It feels good to be of service. It is also important to tame the demon of perfectionism. There is always work to do. Mercury in Virgo opposes Neptune in Pisces (mutable water). This aspect could drive us crazy if we are expecting pristine order in our lives, but can be quite exciting if we are willing to wander into delight. Saturday, August 15. Is it useful? is a good guiding question for today. The Moon makes its first conjunction with Jupiter since Jupiter entered Virgo (mutable earth) on August 11. The Sun and Venus (retrograde) also make a conjunction in the heart of Leo (fixed fire). In simple terms: Leo likes dramatic flair. Virgo likes quiet pragmatism. Do you notice the pull between these in yourself? You might feel misunderstood or like a fish out of water if you can’t find the place that resonates for you. If nothing else, use the trine between Mercury in Virgo and Pluto in Capricorn (cardinal earth) to bring more order or structure into your life. This type of activity brings well-being. Sunday, August 16. The Moon in Virgo (mutable earth) makes a strong, supportive trine to Pluto in Capricorn (cardinal earth) and then makes a conjunction with Mercury in Virgo in the early morning (CDT) Yesterday’s influence on systemization and wholeness carries on today too. Supported areas to focus on would be holistic health, service, getting organized, planning ahead. This should be a nice productive day.